The Tour Edge Exotics CBX Forged irons are designed for performance and are triple forged from Japanese S25c carbon steel for a softer feel and substantial forgiveness in a blade. The dual-level flange design provides an enhanced feel on shots struck low on the face, while still maintaining a thin sole for maximum workability. The face is CNC milled for perfect flatness and the CNC milled square grooves are 100% USGA compliant. 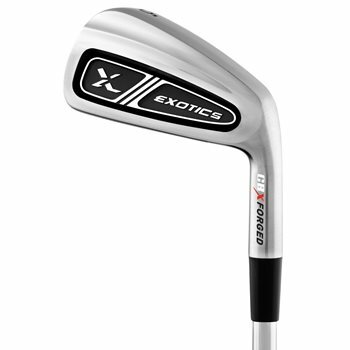 The Exotics CBX Forged irons feature a thermoplastic elastomer alloy insert to significantly dampen vibration and is critical to maintaining exceptional feel in a forged blade.